Dutch studio Ruud Visser Architects have tranformed a 1930s church into a house in Rotterdam, the Netherlands. The architects have created a new volume within the existing building, allowing inhabitants to walk between the new structure and church walls. The open plan interior incorporates the wood-panelled vaulted ceiling and windows of the original building. A glass façade at the rear of the house looks out onto a river. Photographs are by René de Wit. Our project A House in a Church is a beautiful example of adaptive reuse. The 1930's church had ended its career as a religious sanctuary and was being used as a garage for fixing and selling cars before a family came along and wanted to transform it. 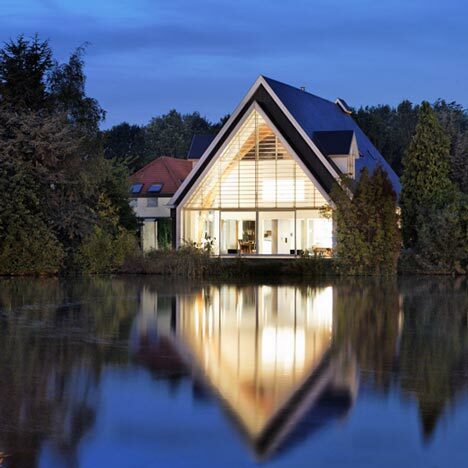 With the help of Ruud Visser Architects and Peter Boer, the church was adapted into a home fit for a family of four. The volume of the church is larger than most average family homes. In order to create the impression of a normal-sized home, the architects decided to place a house within the church rather than using the whole space for the home. So you can actually walk around the new house, while walking inside the church. The last part of the church, the transept, is held open. This was the place of the pulpit. Lightened by the original ‘leaded light’ windows. Situated on the back of the church, directly behind the transept, a smaller volume is placed. This volume is about 7 meters deep and stands with its back façade directly on the banks of the river De Rotte. Originally this volume was the church-choir. But in the existing situation this volume was in complete decline. By this, the house in the church is opened now to the beautiful landscape. And the transept has become a buffer, between the public outside and the private house inside.